The solution of the Bars. A Green Paradise in the Way of Saint James. Councils, planning, Roads, History, Monuments. 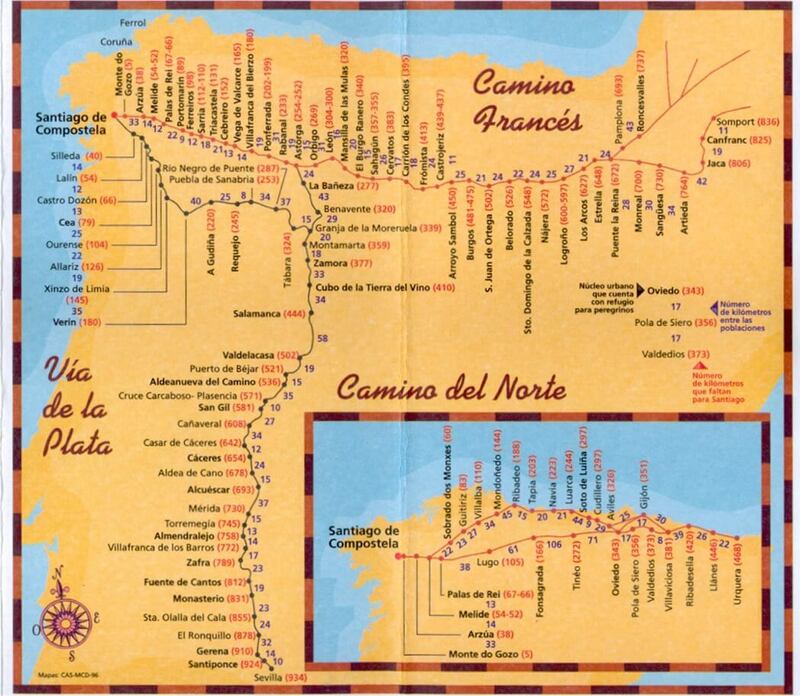 Welcome to the: Way of St. James or St. James Way ( Camino de Santiago) or Camino a Santiago. It plans the Way of Saint James, in very short stages, with little weight in the comfortable knapsack, footwear and clothes. In the Planning of the Way of Saint James , never you must forget, that it is your Way and for that reason you must have time to think and to find " your Way". Has been always said: The Way of Saint James begins in the door of the house of each " , " There are so many Ways as Pilgrims" , " Thousand Ways and a Destiny". There is no a Way, each pilgrim, makes his Way and there is so many Ways, as Pilgrims. Until not long ago time, the Way of Saint James was route by Pilgrims went to Santiago, moved solely by its Great Faith and realised Promises. Today the great majority of the Pilgrims, is addition to him a Playful component and of Tourism, that we wished to channel, and a new alluvium of Tourists, without religious motivations, crosses the Way to Saint James. Pilgrim in the Way of Saint James: It looks for the Network of Shelters and Refuges. Tourist in the Way of Saint James: Lodging in Hotels and Inns. At certain times, he is advisable to make Reserves of Lodging. 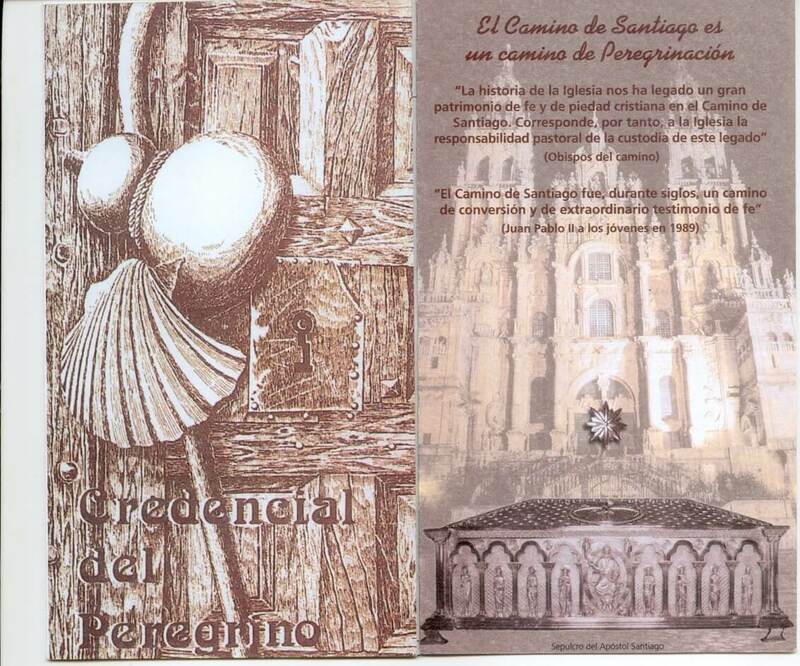 4.- Historical Documents and correspondence of Pilgrims that guarantee the use of same. 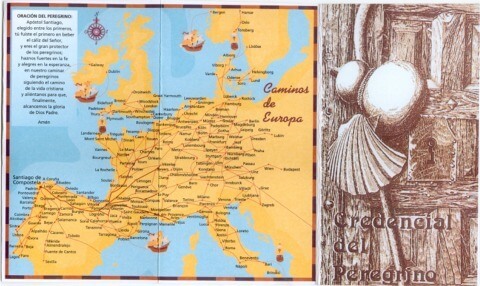 Miracles and Legend of Pilgrims throughout the Camino. 5.- Churches and Chapels, with images of the apostle, architecture Romance. We are thankful, any aid, that facilitates the definition to us of the ways and we are arranged, to learn and to modify any inexact information, that we could provide. To plan means to realise the Way of Saint James: On foot, To Horse, in Bicycle. 1.- Like making the Way of Saint James: On foot, To Horse, in Bicycle. The normal thing is to do Walked it. In Bicycle and to Horse usually one becomes in Groups. To Horse you must anticipate the stables and feeding of the Horse. 2.- That age you have and in which forms physics you find. To make the Way of Saint James is a concerted effort. The normal thing is stages of 20 km If you are young and these very trained to walk you can arrive at 30 km If you have more than 50 year we advised stages to you of 10 to 15 km. If you have some problem of health, you must consider the possible points of Attendance. 3.- How long you arrange to make the Way of Saint James. It remembers that you need to do a minimum of 100 km walking or to horse and 200 km in bicycle. How long you have to make the Way of Saint James. 4.- If you have 1 Week. We advised to start off to you from Vega de Valcarce, you would cross the Portazgo (old Toll) and you would enter Galicia. If you feel with more forces, you can extend one or two stages beginning in Ponferrada or Villafranca del Bierzo. 5.- If you have 1 Month, good health and physical training you can start off from Saint Jean de Pied de Port. 6.- Of where you are going to start off and where you are going to initiate the Way of Saint James. It decides the Way, what is your city, it looks for the Departure Points and the possible companions of Way and decides the Point of Beginning. It chooses transport means, in order to travel of the departure Point to the Point of Beginning. To see Table Where To begin You must count on the Climatology, based on her chooses the equipment. 8.- Knapsack. It does not exceed the 5 kg of weight. Lately we see loaded young pilgrims with great Knapsacks of 10 and 20 kg, adapted to go to the mountain, but your you are a Pilgrim and you will be able to acquire everything what you need in the Way and to do without many accessory things. 9.- Points of Beginning in the Way of French Saint James. The Way to Saint James, has had a series of Points of Beginning, from where you will be able to begin the Peregrination. In order to make your Peregrination more bearable, we have created the departure Points, like meeting places, where you will be able to contact with more pilgrims and to initiate the trip until the Point of Beginning of the Way. During the Way it uses the Points of Contact. Economic planning of the Way of Santiago. Way of Santiago on foot. The accomplishment of the Way of French Saint James on foot, supposes a small economic payment. The numbers offered, by the tourist authorities locate, it in 22 € to day. It supposes, to spend the night in Shelters public and an feeding with Meals of the day and dinners with cold cuts and fruits. If you wish to realise the Way, eating in Restaurants and sleeping in Private Shelters and Inns, the cost is placed in the 50 interval from the 30 to € to the day. For the other Ways the number is increased when having to use Deprived Inns and Shelters, being placed in the interval 30 from 50 to € to the day. Way of Saint james in Bicycle. The accomplishment of the Way of Saint James in Bicycle, would move in the same amounts, but it must consider that in Albergues Public, the preference the Pilgrims have on foot. Way of Saint James (from Santiago) to Horse. The accomplishment of the Way of Saint James to Horse, supposes a payment among 100 and 150 € to the day, following if the accomplishment it is with own horse, if support car is used or the services of the specialized companies are contracted. That Route you are going to make the Way of Saint James. Can be made only using Shelters (Refugios or Albergues). It has all the Services. Recommendable to make on foot and without limitation of age and with fisicas conditions minimas. The network of Shelters is little and you must complete it with the use of Inns and Hotels. Suitable for the tourism of young people on foot, bicycle or to horse. The network of Shelters is little and you must complete it with the use of Inns and Hotels. Idoneo for the tourism of young people. Is shortage of Shelters(Refugios o Albergues), very long stages, that in summer are conviertenen interminable. It turns out idoneo to make to horse or in mountain bicycle, whenever a good fisica condition is controlled. You must use Inns and Hotels. Too long and unforseeable Way is from English Santiago Badly equipped with Shelters, although you facilmente found Hotels, Inns and restaurants. Idoneo to make tourism on foot. Badly equipped with Shelters, although you facilmente found Hotels, Inns and restaurants. Idoneo to make tourism on foot. The pilgrims ones from the Way to Saint James, take a passport, that denominates Cedencial. The credencial is a pass which allows (sometimes free) overnight accommodation in shelters (refugios). The Credential, is donated in the churches, St. James organisation and refuges and can be bought by some € in the Travel agencies. The pilgrim was entitled to a partial indulgence, or, if the compostela was obtained in a Holy Year, a plenary indulgence. Like making the Way: On foot, To Horse, in Bicycle. The normal thing is to do Walked it. In Bicycle and to Horse usually one becomes in Groups. To Horse, you must anticipate the stables and feeding of the Horse. To make the Way is a concerted effort. The normal thing is stages of 20 km If you are young and these very trained to walk you can arrive at 30 km If you have more than 50 year we advised stages to you of 10 to 15 km If you have some problem of health, you must consider the possible points of Attendance. Whichever time you have to make the Way of Saint James. It remembers that you need to do a minimum of 100 km walking or to horse and 200 km in bicycle. 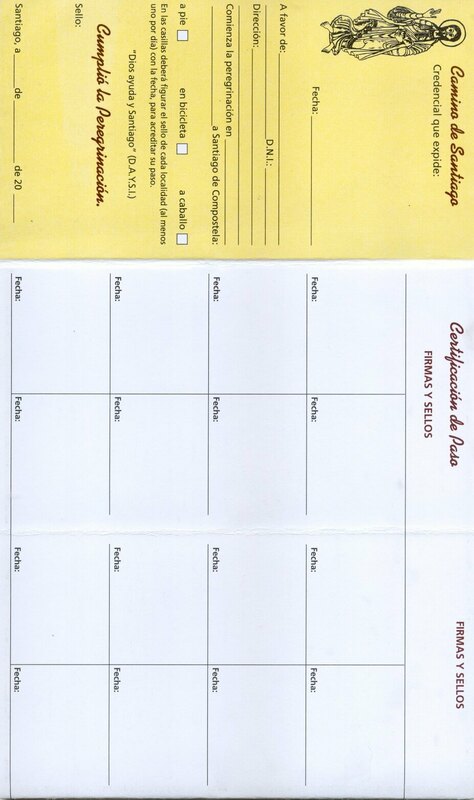 If single you wish to obtain the Compostela, remembers that you must do a minimum of 100 km walking. We advised to start off of Sarria. If you have to you 1 Week. We advised to start off to you from Vega de Valcarce, you crossed the Portazgo and you entered Galicia. 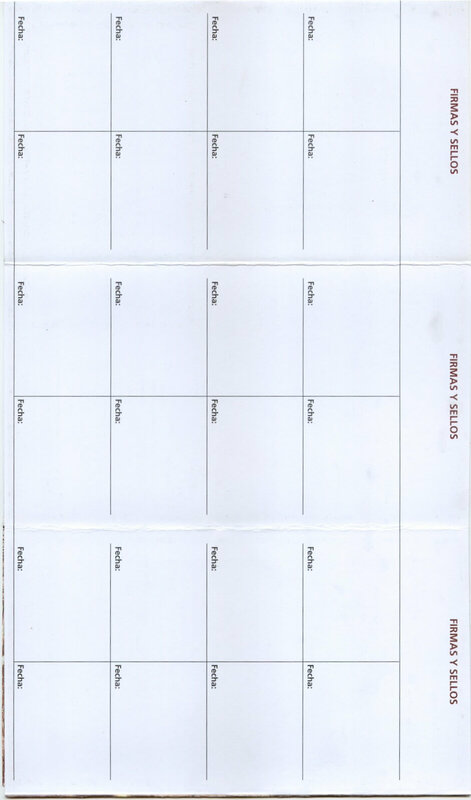 If you feel with more forces, you can extend one or two stages beginning in Ponferrada or Villafranca of the Bierzo. If you have 1 Month, good health and physical training, you can start off from Saint Jean de Pied de Port. It decides the Way, as it is your city, it looks for the departure Points and the possible companions of Way and decides the Point of Beginning. It chooses transport means, to travel of the departure Point to the Point of Beginning. To see Table Where Begin .You must count on the Climatology, based on her chooses the equipment. The best time, you contemplated the explosion of the Spring, surrounded by Flowers and trills of Birds, the way to you will become very short and you will be able to enjoy those long days. There is no saturation in Albergues and the temperature and humidity it is the ideal. It is the age of greater Peregrination, but that does not mean that he is the best one, is an alternative to the previous one. Too much heat and saturation in Albergues.